“Government is paralyzed today. We are not in a position to appoint or transfer officers. What is the purpose of the recent constitution bench judgment then? There is some urgency”, Senior Advocate P Chidambaram, one of the lawyers appearing for Delhi government submitted before the bench. The Delhi government today urged the Supreme Court to hear the pending petitions pertaining to its turf war with the Lt Governor urgently but a bench headed by Justice A K Sikri said it is not in a position to hear it before July 25 and fixed it for July 26. The one related to control over services, that is the power to appoint and transfer bureaucrats is the most crucial one pending before a two-judge bench. “Government is paralyzed today. We are not in a position to appoint or transfer officers. What is the purpose of the recent constitution bench judgment then?. There is some urgency”, senior advocate P Chidambaram, one of the lawyer appearing for Delhi government submitted before the bench. But justice Sikri sitting along with Justice Navin Sinha said “See we are not in a position to hear it before July 25. Let us fix it for the time being on July 26. We will see on that day”. By its July 4 significant judgment, Supreme Court had restricted the jurisdiction of LG to matters of land, police and public order. It also said he could not take any independent decisions and is bound by the aid and advice of the council of ministers headed by the Chief Minister. Within six days of it, on July 10, the AAP government moved the Supreme Court again seeking early hearing of the pending petitions wherein it wants the apex court to conclusively adjudicate as to who holds the jurisdiction over services, powers of the Anti-Corruption Bureau and to appoint enquiry commissions etc. This is because the Centre contends that the SC constitution bench judgment had merely drawn a line regarding the powers of both the LG and Chief Minister and had not quashed or stayed any of the Delhi High Court’s order upholding several of it’s notifications or actions of the Governor. 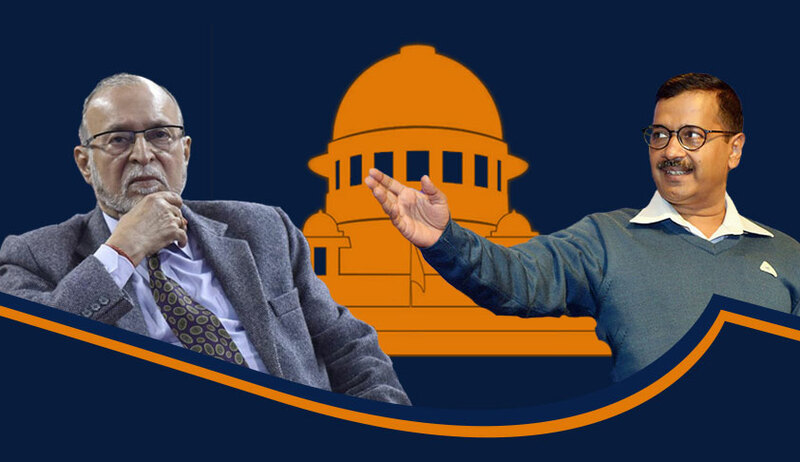 Immediately after the SC judgment, Kejriwal sent a letter to Baijal urging to fully implement the apex court order giving primacy to the Delhi government. But LG responded that appeals were pending before a division bench in the top court and accused the AAP government of drawing “premature conclusions”. Kejriwal contends that SC ruling made it amply clear that the executive powers of Centre are limited to three subjects only (land, police and public order) only and SC striking down the Home Ministry’s 2015 notification brining services under it is a mere formality. The pending issues include Delhi government’s challenge to MHA notification of May 2015, July 2014 bringing services under LG, Validity of MHA notification disallowing anti-corruption bureau to take cognizance of offences against Central government officials, Kejriwal govt’s challenge to HC order which said Delhi government did not have power to appoint enquiry commissions without LG’s approval, six petitions challenging Revenue Department notification revising minimum rates of agricultural land without LG approval, challenge to order passed by Delhi Power Department appointing nominee directors on the board of electricity distribution companies without placing it before the LG, challenge to HC order declaring as illegal Delhi's Dept of Power notification issuing policy directions to the Delhi Electricity Regulatory Commission regarding disruption in electricity supply to consumers & compensation and Centre challenging HC order that declared as illegal, the appointment of a special public prosecutor in a corruption case related to issue of fitness certificates to commercial vehicles.